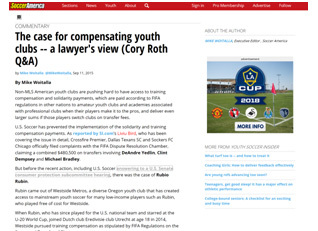 Attorney Cory Roth is an internationally recognized soccer lawyer. His caseshave been covered by ESPNFC, Sports Illustrated, Soccer America, VICE Sports and World Football Insider. Known to be a fearless visionary with righteous beliefs backed by a deep knowledge of the law, FIFA Regulations and soccer, Attorney Roth’s cases have literally changed the discussion about certain issues in American soccer andare in the process of changing American as we know it. His goals are simple: win respect, develop relationships, and get the best results possible for his clients. 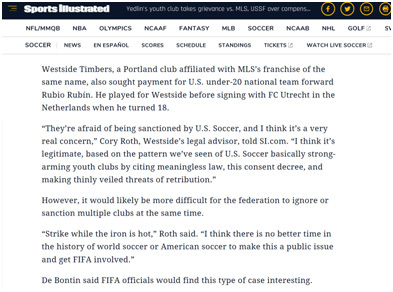 Others in the footballing world have taken notice of Attorney Roth’s vision, legal knowledge and refusal to back down – even when threatened by the likes of agents, foreign clubs, and the United States Soccer Federation. Thanks to his work, he has developed relationships with people at many levels of the game from Development Academy club presidents to the owners of professional teams, league commissioners and the top soccer lawyers in the world. These relationships put him one call away from many in the footballing world. It is worth noting that many of these people have reached out to Attorney Roth after reading about his cases in the media. These invaluable relationships allow Attorney Roth’s clients to benefit from his always-growing network of attorneys, agents and club administrators. Before going further into detail about who Cory Roth is and what makes him uniquely qualified to represent you, your club, your organization or a loved one, you should know the type of clients we represent, and on what types of matters. No matter who Attorney Roth represents, he is always client centered. His goal is always to provide clients with the best information possible—explaining the potential risks and rewards—so that the client and his or her support systemcan make a decisionin the client’s best interests. Attorney Roth will never put his interests above yours. Cory Roth Law Office represents “soccer clients” such as youth soccer clubs that have developed professional soccer players in training compensation and solidarity fee claims.He advises youth soccer clubs on best practices, marketing, advertising, sponsorships, mergers, dealing with local governments, land/field purchases, dealing with local, state, and nationalyouth soccer associations and the United States Soccer Federation. Further, he can advise and guide your youth soccer club through the process of creating strategic partnerships with foreign and domestic professional soccer clubs for the exchange of players, business practices and coaching models. Attorney Roth also represents and advises state youth soccer associations and state adult soccer associations and can mediate disputes between players, clubs and associations. Attorney Roth represents and advises semi-professional and professional soccer clubsin creating contractsthat protect the professional club by preserving sell-on and other rights;player-contract negotiations;training compensation and solidarity fee disputes from preliminary inquiries through the FIFA Dispute Resolution Chamber and Court of Arbitration for Sport; player contract disputes under the FIFA Regulations on the Status and Transfer of Players;terminating player contracts for just cause; advising clubs on marketing, advertising, sponsorships and merger opportunities; dealing with localandnational soccer associations, professional leagues and with the United States Soccer Federation; creating community partnerships; and, creating strategic partnerships with foreign professional soccer clubs for the exchange of players, business practices and coaching models. Finally, Attorney Roth represents professional soccer players and those aspiring to play professional soccer in the capacity as an agent, attorney, advisor and confidant.His client-centered and collaborative practice strategy helps prepare players physically, mentally, emotionally and culturally toput them in position to succeed. We are always willing to think outside of the box, utilize technology, and take risks to help make dreams come true. We know that you or organization are more than a name and set of statistics. There is a story to tell that will help us achieve our goals whether they are signing a professional contract, developing a strategic partnership with a foreign club, or winning claims for training compensation and solidarity fees. Attorney Roth has negotiated with MLS clubs, national federations, and foreign professional football clubs. In addition to his soccer related negotiation experience, Attorney Roth regularly negotiates with prosecutorsand debt collection firms representing local governments.Cory has honed his craft as a story teller and trial lawyer to consistently get incredible results in high stakes trials. Being a trial lawyer, Attorney Roth can identify strengths and weaknesses every case and client. He then uses that knowledge to develop compelling themes and stories to advance his clients’ causes. 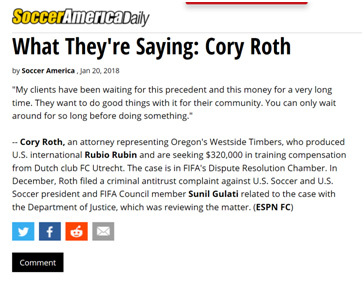 Finally, Attorney Roth has been the attorney of record on several cases before the FIFA Dispute Resolution chamber on behalf of some of the top youth soccer clubs in the United States and is able to represent you in front of the DRC or the Court for Arbitration of Sport. Attorney Roth has had a lifelong connection to soccer. He played club, high school, PDL, college, men’s league, and futsal in addition to training at the world famous Tahuichi Academy in Santa Cruz, Bolivia, and for the United States Macabbiah National Team. He got his start as a soccer lawyer by representing Westside Timbers youth soccer club of Beaverton, Oregon. Westside Timbers had a tradition of developing professional soccer players who come from underprivileged backgrounds. In the summer of 2014, one of their alumni, Rubio Rubin, signed a contract with FC Utrecht of the Dutch Eredivise. The Dutch Federation would not issue Rubin’s International Transfer Certificate as there was a concern over whether my client was entitled to training compensation. Rubin’s agent prepared a letter at FC Utrecht’s direction for my client to sign that would have waived its rights to FIFA Training Compensation and Solidarity Fees. I advised my client to not sign the documents as written, and the rest is history. 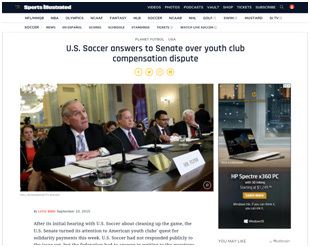 From that point forward, Attorney Roth networked with people in the soccer community and created channels of communication with FIFA personnel and the United States Soccer Federation. He is most well-known for filing the first training compensationclaim with the FIFA Dispute Resolution Chamber in the history of American soccer.Attorney Roth’s helped expose to FIFA the problem of inadequate player registration records in the United States. 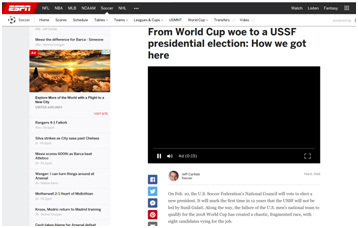 In response, FIFA ordered the United States Soccer Federation to issue to each amateur player in this country a unique number, like a social security number, that would follow the player throughout his or her entire career to improve player registration practicesand improve the odds that youth clubs get the training compensation and solidarity fees they deserve. In response to the USSF, through Gulati, making the FIFA Dispute Resolution Chamber take Attorney Roth’s cases of the docket the day before they were to finally be heard, Attorney Roth filed a complaint with the United States of America Department of Justice Antitrust division because it was clear that the USSF blatantly favors Major League Soccer to the detriment of all non-MLS professional clubs and youth academies. As of the writing of this paragraph, we are still awaiting a decision from the FIFA Dispute Resolution Chamber on the matter of training compensation and solidarity, but we expect to set precedent by winning, even if we must go to the Court for Arbitration of Sport to achieve justice. Beware of imposters and ‘twitter experts.’ Don’t listen to agents and professional clubs who tell you “no.” Know your rights as a player or organization. Know what is in the best interest of the families you represent. 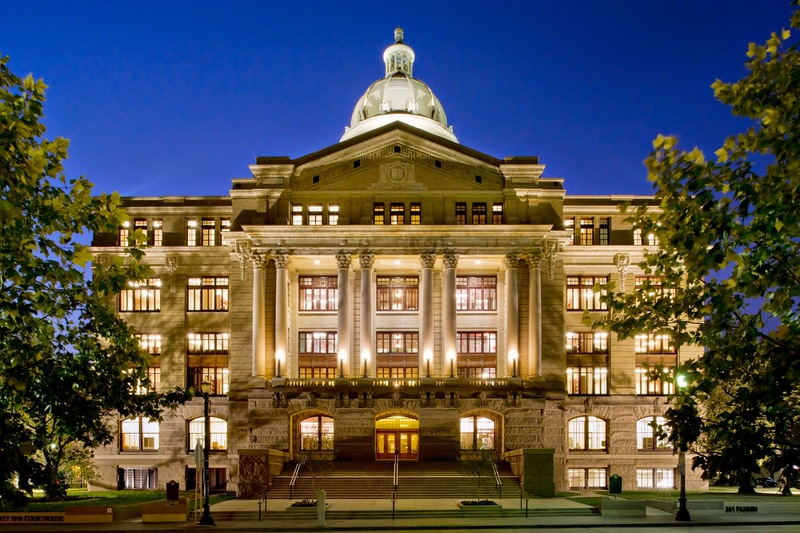 Give Attorney Roth a callat 832 419 9973 so he can determine whether you have a case or circumstance that could use the help of the soccer lawyer. All clubs associated with the United States Soccer Federation are FIFA clubs. Therefore, if your club, league or state association is a member of the United States Youth Soccer Association, US Youth Soccer, United States Amateur Soccer Association or a recognized professional league sanctioned by the United States Soccer Federation, your club is a FIFA club.All FIFA clubs are entitled to the same rights and responsibilities. The rights and responsibilities of your youth, adult amateur, or professional club are enshrined in the universally binding FIFA Regulations on the Status and Transfer of Players. Rule 20of the Regulations on the Status and Transfer of Players creates the training compensation system. The rule states that when a player signs his first professional abroad or is transferred between clubs of two different associations until the season of his 23rd birthday, the youth club, adult amateur or semi-professional, or professional academy clubs that trained him between the season of his 12th birthday and the season of his 23rd birthday are entitled to a fee known as training compensation. The training compensation must be paid within 30 days of the player’s registration. To be entitled to receive training compensation, the player must have been registered to the club. Therefore, a club that allowed a player to be guest player for a tournament would not be entitled to training compensation just as a coach who ran private training sessions would not be entitled to a share of the money. There are times when the player passport does not accurately reflect the player’s registration history. 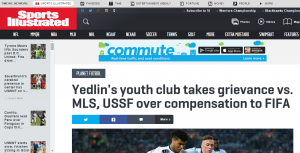 In those cases, Attorney Roth can help you piece together evidence that will cause the United States Soccer Federation or other registrar to correct the player passport so that your club gets the amount of money it is owed. The amount owed is based on two factors: first, the category of the club the player signed with, and send, the years the player was registered to and trained by the amateur or youth club. The training compensation fee owed for years 12 through 15 is lower than the later yearsbut can still be as much as 10,000 euros per year. Years 16 through 23 could net a youth or amateur club as much as 90,000 euros per year. The value is so high because that is the amount of money it would cost an English Premier League club, for example, to produce a player of the same quality your club produced who is good enough to sign a profession contract. Rule 21 of the FIFA Regulations on the Status and Transfer of Players creates the solidarity fee system. The rule states that when a player is transferred or loaned for a fee to a professional team in a different country, his youth and adult amateur soccer clubs are entitled to an amount of money known as a solidarity fee. Free transfers and transfers between clubs in the same association do not create the right to collect a solidarity contribution. The purpose of the solidarity, payment or contribution, as it may be known,is to strengthen the international soccer community by recognizing that youth clubs play an important role in the development of professional soccer players. Under the solidarity fee rules, 5% of the transfer fee must be reserved to be paid to the player’s training clubs, and it is the new club’s obligation to pay the training fee within 30 days of the transfer. Much like the training compensation system, the solidarity fee system is broken down into seasons – therefore for each season the player was registered to a particular club, a certain amount of solidarity money is owed to that club.The amount owed for the seasons of the player’s 12th through 15th season is lower than the amount owed for the seasons of his 16th through 23rd season. The most famous example of solidarity fees is that of Arjen Robben, whose solidarity fees have been used to fund his youth club for years. Attorney Roth is one of the only lawyers in the country experienced with and genuinely knowledgeable about training compensation and solidarity fee issues in the United States. He is able to advise your youth, academy, adult amateur, semi-professional or professional soccer club on how to preserve and protectits rights to collect training compensation and solidarity fees; he can advise and represent your club and its board in regards to interacting with foreign clubswho have signed or are about to sign your player; he can advise your board members on their fiduciary duties to the club and how to avoid breaching those duties; he can draft responses all types of interactions with professional clubs and agents, including when they ask you to waive your rights to training compensation and solidarity fees; Attorney Roth is able to negotiate training compensation and solidarity fees with foreign clubs and negotiate strategic partnerships for the exchange of players, coaches, coaching models and business practices with foreign clubs in lieu of training compensation and solidarity fees or complimentary thereto; he is also able to draft youth, adult amateur and professional player contract clauses that protect your club; he is able to communicate with foreign football federations and professional teams in a way that creates an evidentiary paper trail to protect your rights and reputation; Attorney Roth is able to draft, file and litigate training compensation and solidarity fee petitions with the FIFA Dispute Resolution Chamber; in the event that we do not achieve the result we want from the FIFA Dispute Resolution Center, Attorney Roth is also able to appeal an order, or lack of order, to the Court for Arbitration of Sport on procedural or substantive grounds; and, finally, Attorney Roth is able to utilize his connections in football to associate with the top soccer attorneys in the world if we need a little more muscle. Attorney Roth is more than happy to speak to coaches, club board members, CEOs, club presidents, agents/intermediaries, attorneys, players, front office staff and the media about training compensation and solidarity issues free of charge to evaluate whether you may have a case or issue that could use or require the assistance of a soccer lawyer. Terms of engagement with the law firm will be discussed over the phone, via email, or in person, but training compensation and solidarity fees generally do not cost you or your organization any money out of pocket, so do not be discouraged by your financial situation. Attorney Roth got into this business in large part to move the ball forward and develop the sport of soccer in the United States and our standing relative to other footballing nations. The United States has a diverse soccer community. There are many pros and a few cons to our diversity. One of the cons is our proximity to Mexico. Mexico and Mexican clubs are notorious for poaching many of the top youth soccer players from the top youth soccer clubs, especially in the border states of California, Arizona, New Mexico and Texas. This poaching results in the top youth soccer clubs and academies, including MLS academies in the United States losing players to Mexico. 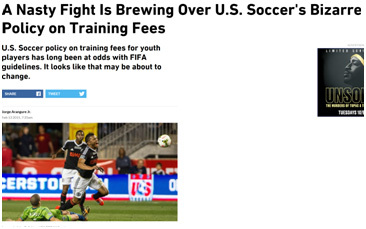 This is not only bad for American soccer, but it is often bad for the young players moving abroad and can even be considered human trafficking. Thankfully, Rule 19 of the FIFA Regulations on the Status and Transfer of Players, titled ‘Protection of Minors,’ creates rules that limit when a player under 18 can move to Mexico or otherwise abroad. It states that while players under 18 are not allowed to be transferred internationally, the player may move abroad if his parents move to the other country for non-sporting reasons, the transfer takes place in Europe or the player lives no further than 50 kilometers from the border and the club is no further than 50 kilometers on the other side of the border. Every international transfer under any of these circumstances is subject to approval by a subcommittee of the FIFA Players’ Status Committee. Attorney Roth is able to represent your youth or professional club in the United States or Mexico or the player and his family and guide the client through the process of the international transfer of a minor, and ensure that all procedures are followed. Attorney Roth can also help your club lodge a complaint with the FIFA Players’ Status Committee if any of the rules meant to protect your child, familyor club were not followed. 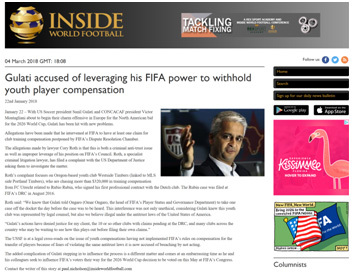 FIFA created rules relating to the creation and termination of professional player contracts. Player contracts can be terminated with or without just cause or just sporting cause by the player or the professional club. Attorney Roth can help professional clubs and players navigate the decision whether to terminate a contract and the potential consequences thereof. In the event that a contract termination dispute ends up at the FIFA Dispute Resolution Chamber, or that your would like to take it to that judicial body, Attorney Roth can represent you in those proceedings.